Who: 2012 HISD Board President Mike Lunceford and recently elected 2013 HISD Board President Anna Eastman sit down for a discussion on the district’s recent accomplishments and upcoming priorities and initiatives for 2013. Topics discussed include the 2012 bond program and an upcoming third-party survey of HISD parents, students and staff. This is Lunceford’s last time serving as host of the monthly television program as he passes the reigns to Eastman. This entry was posted in 2012 bond, Board of Education and tagged 2012 bond, Anna Eastman, HISD Up Close, HISD-TV, Mike Lunceford on February 21, 2013 by HISD Communications. This entry was posted in Board of Education, Uncategorized and tagged Board President, District III, HILZ, Las Americas Newcomers, Long, Manny Rodriguez, Mike Lunceford, Scarborough, Up Close on November 26, 2012 by HISD Communications. Principal Amy Simson welcomed HISD Board of Education President Michael Lunceford, Chief School Officer Sam Sarabia, and the grandson of E. O. Lovett at the elementary school’s official dedication held March 8, 2012. Edgar Odell Lovett Elementary School was named for the first president at Rice University. Both the university and elementary school share the same mascot and school colors. Principal Simson thanked the community, parents and volunteers for helping build a solid foundation for the children to excel, using both technology and art. 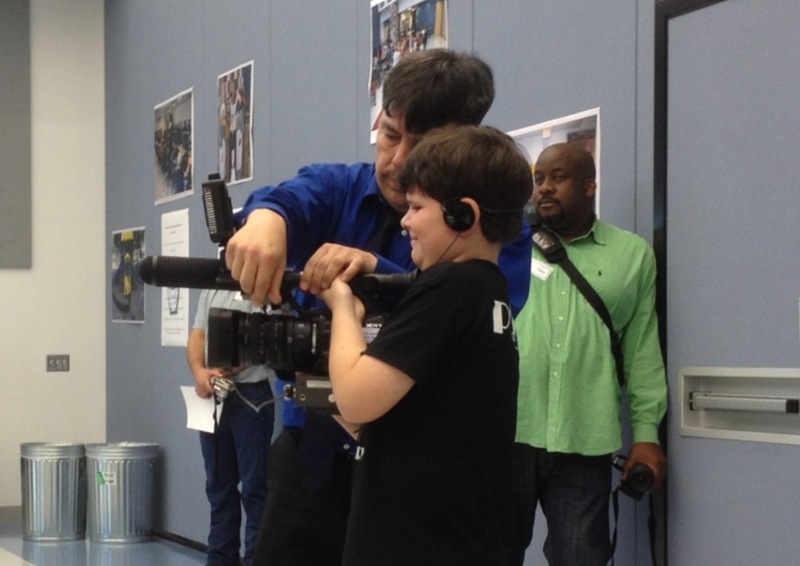 A student on Lovett's WHO TV crew works with Aaron Casares from HISD's Multimedia Services team. Lovett’s all-student WHO TV crew worked with HISD TV to cover the event, including holding the cameras, and shooting footage. Chief Elementary School Officer Sam Sarabia congratulated Principal Simson for Lovett’s continued achievements, and recognized longtime band director Ginny Croft, whose 30-year tenure has earned numerous performing arts accolades, at both the district and state level. This entry was posted in New schools and tagged Amy Simson, HISD bond, Lovett Elementary, Mike Lunceford, WHO TV on March 19, 2012 by HISD Communications. Administrators, staff and students will be joined by HISD Board of Education President Michael Lunceford and Superintendent Terry Grier during the official dedication ceremony for the new Paul W. Horn Elementary today at 9 a.m. at the new campus, 4530 Holly Street. All building systems on the new campus were designed to yield a projected increase of 24.6 percent in energy efficiency. Click image above for video tour. The new Horn facility is built to Leadership in Energy and Environmental Design (LEED) standards and all building materials were made using 41 percent recycled content. All building systems on the new campus were designed to yield a projected increase of 24.6 percent in energy efficiency. The district has committed to build all new construction projects to LEED standards. Smart Board technology in all classrooms. For more information about other school construction projects district wide, visit www.hisdprojects.org. This entry was posted in New schools and tagged $805 million, 2007 bond referendum, dedication, Horn Academy, LEED, Mike Lunceford, new elementary, Terry Grier on March 6, 2012 by HISD Communications. 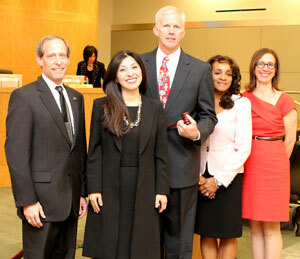 HISD District V Trustee Michael Lunceford was unanimously elected Thursday to serve as 2012 President of the HISD Board of Education. The HISD Board of Education officers for 2012 are (L-R): Assistant Secretary Greg Meyers, Second Vice President Juliet Stipeche, President Michael Lunceford, Secretary Rhonda Skillern-Jones, and First Vice President Anna Eastman. The father of two HISD graduates, Lunceford is a graduate of HISD’s Westbury High School and a Bellaire resident. Lunceford received a bachelor of science degree in petroleum engineering from the University of Texas at Austin in 1981 and is currently the vice president of engineering for Pedernales Energy. In his acceptance speech, Lunceford said he chose to wear a neck tie adorned with the images of children, instead of a more traditional “power” tie, to send a message. This entry was posted in Board of Education and tagged HISD Board of Education, Mike Lunceford on January 13, 2012 by HISD Communications.